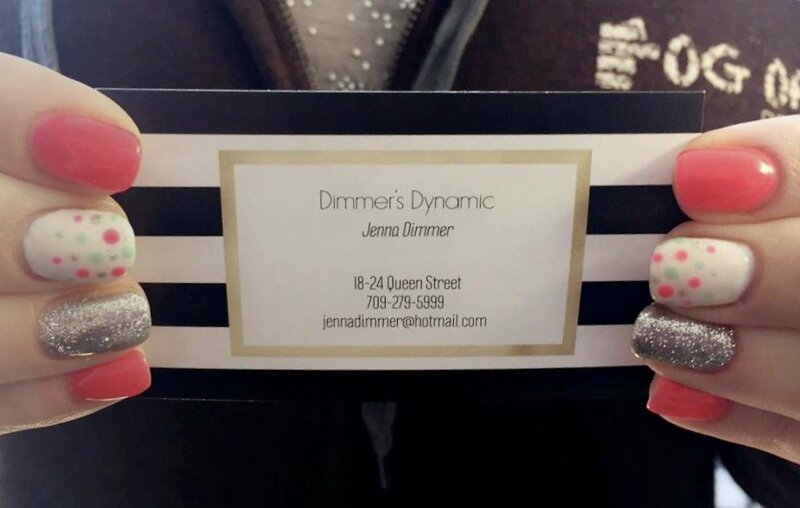 Today we are chatting with Jenna from Dimmer’s Dynamic Salon based in Marystown, NL. My business name is Dimmer’s Dynamic Salon. My business is a hair salon and day spa. I currently have one employee other than myself. We offer services such as colours, cuts, foils, highlights, men’s cuts, finger nail polish, shellac (fingers and toes), gel nails, pedicures, and waxing’s. 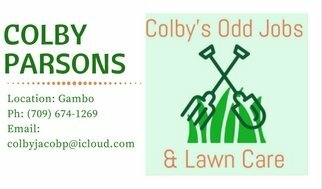 I started my business in 2015. For two years before this date I worked for a lady and ran her salon while she was on maternity leave so I knew all the ins and outs of it before I started which made me even more determined. I started my business before knowing about Youth Ventures, but since I joined Youth Ventures has helped me advertise, provided me with gift cards/business cards. 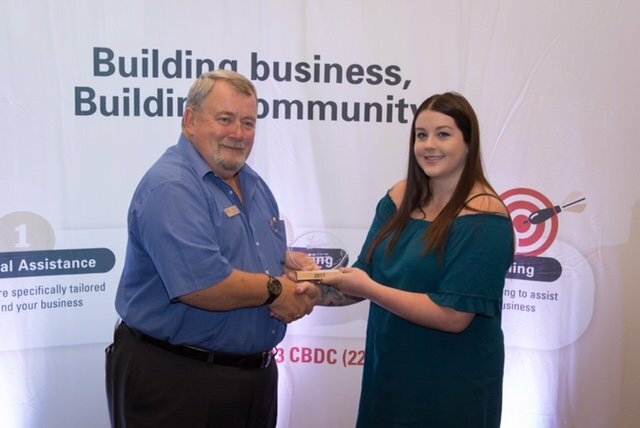 Last year when I won the Financial Management Award from Youth Ventures it also helped me because I used the award money for new products and tools for the salon. My dream for my venture is to eventually expand my salon. I want to move locations in the coming years so that I have the room to expand. Adding more chairs and more rooms will give me an opportunity to take in more clientele and hire more employees. I enjoy the flexibility of owning my own business the most. I can have a day off when I need it, I can work what hours I wish. It allows me to be more accommodating to clients as well because I don’t “have” to be closed or open by a certain time. The greatest challenges in getting started was straightening up all the legal work that was necessary. I needed a business number, business permit, a business account with the bank along with a debit machine, and business insurance. My biggest success so far would have to be hiring a good employee. I am having a baby so I was going to need some time off, so I hired an employee at the beginning of March to give my clients time to get used to her while I was taking some time off work. She brought a lot of new clientele with her which helped in expanding my business as well. Now she is running my business for me while I am on maternity leave and all my clients are happy which makes me happy and relieved. My only advice would be not to give up. Sometimes it gets hard, tricky, or confusing but in the end it all works out. If you want to start a business, do it! If it doesn’t work out, that’s fine too but you’ll never know if you don’t try. As I said earlier, I wish to expand my business. I would like a bigger place for the salon so that I can hire more employees and offer more services. My plan is to start enquiring about bigger locations when I am back to work in about a year. 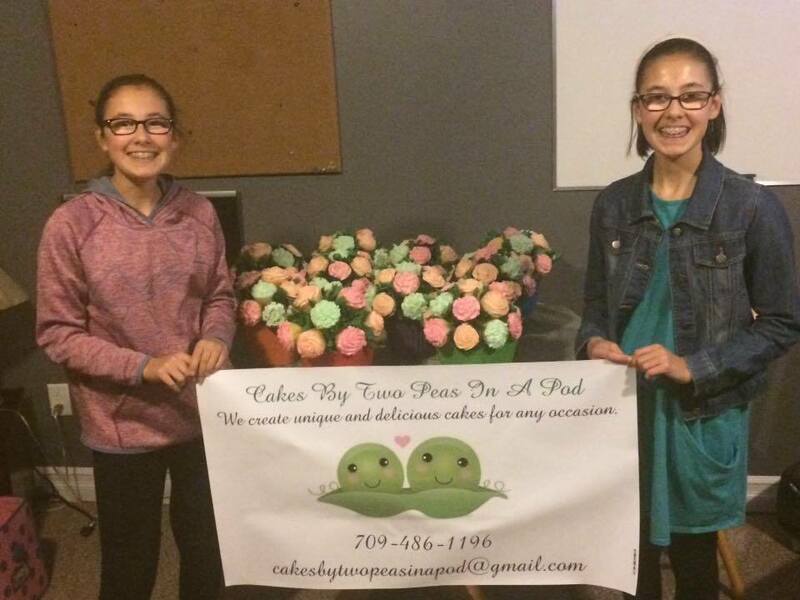 Today we are chatting with Cora and Devyn from Cakes by Two Peas in a Pod based in Grand Falls-Windsor, NL. 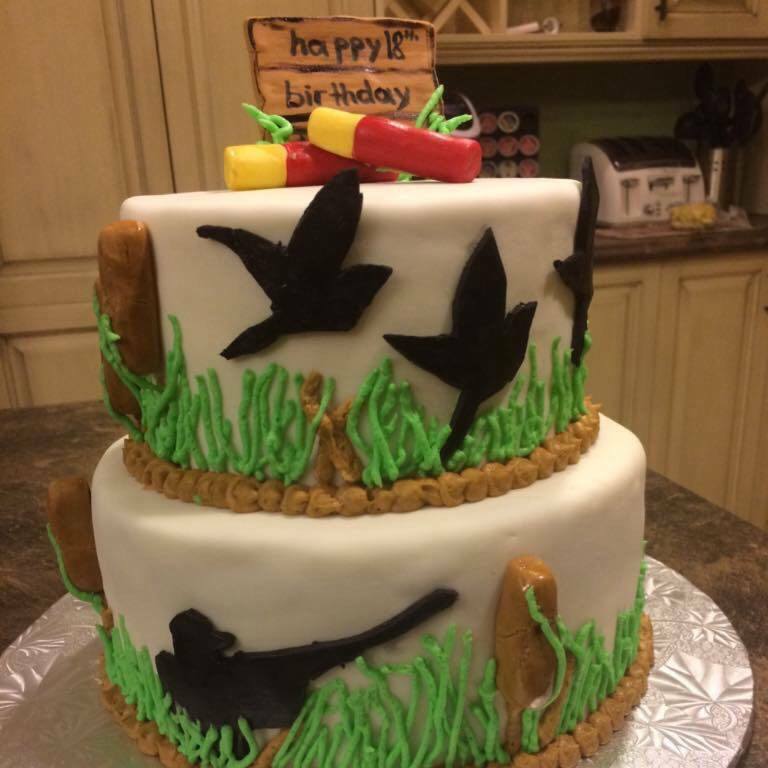 We create unique and delicious custom cakes and cupcakes for any occasion. We have our own invention, Cake Truffles. 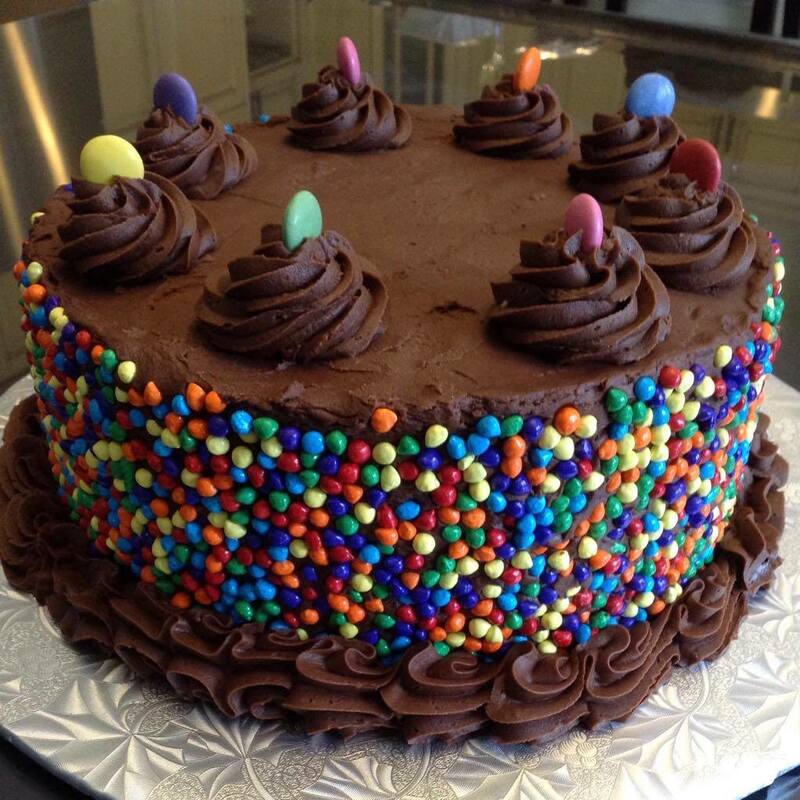 It is cake mixed in with buttercream and covered in chocolate. They are our bestsellers. Our business started with the love of baking and cooking. We were always making treats for friends and family and decided to share our talent with everyone. Enjoying what you do while making people happy is an amazing feeling. Youth Venture is an amazing program. They give you advice on how to contain orders and get publicity. Also giving you opportunities to sell your products such as town events, fundraisers and farmers markets. They are helping us a lot. Every few weeks we have a meeting and discuss what we want to do and upcoming events. 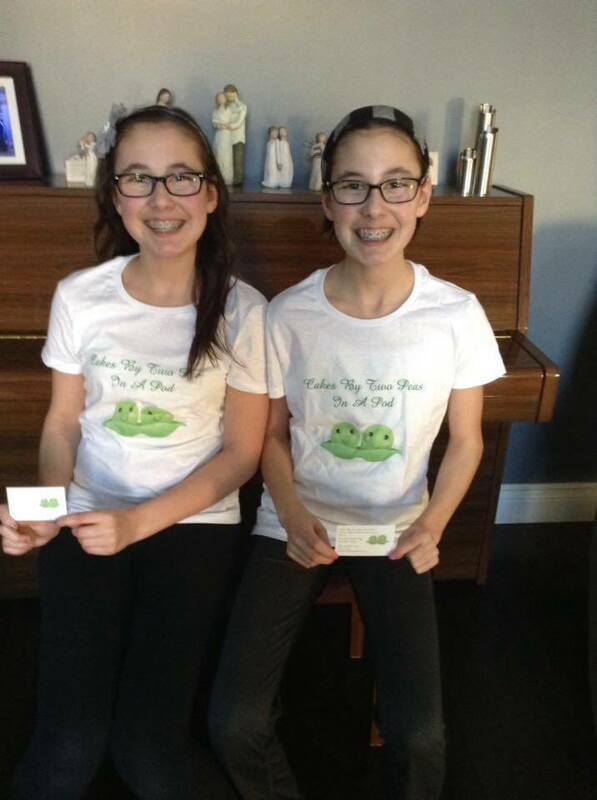 Our dream is to someday open up our own restaurant called Two Peas In A Pod and Bakery. We’ve always had an interest in cooking and baking unique creations. We also want to open up a barbecue style restaurant called Eat like a Hogg with two g’s after our last name. Tell us about you experience with competing in the Skills Canada competitions. Competing in the Skills Canada competitions was an amazing experience. We got to meet other very talented chefs and share our experiences with each other. It was great knowing when we talked to them they knew what we were talking about. Sometimes kids don’t have a clue what julienned vegetables mean, or what gum paste is. 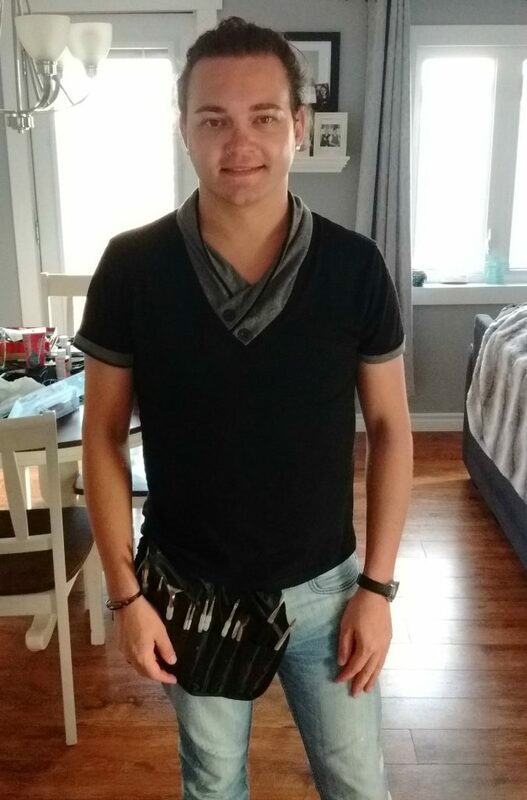 Thanks to one person we were inspired to participate in Skills Canada. Emma Power is an alumni Skills Canada participant. She inspired us to create our own business like she did, she had a cake baking business when she was our age. While participating with Skills Canada she accomplished great things. She is a role model, teacher and great friend. Skills Canada definitely inspired our cooking adventure. We got to meet some of the best chefs in St. Johns. 2 years before we entered in Skills Canada, we participated in a kids cooking camp in P.E.I. at the Holland College. We learned how to cook cuisine from all over the world. We look forward to competing with Skills Canada again this fall. Honestly, the best thing is knowing you own it, that it’s yours. Having the responsibility of maintaining it is a great experience for kids our age. Sometimes, it gets stressful, but it only makes us stronger. We always have each other’s backs. We are lucky we have each other. Going into it, we knew cake supplies would be expensive, but once we started we didn’t make a lot of money due to costs. We would go through about 5 blocks of butter a week, sometimes 10. Boxes, cake boards, cupcake boxes and supplies are extremely expensive. We know this year being our first year we won’t make as much as we would if it were our third year. Getting started was very stressful but we are happy it’s over. We are now stocked up on everything, but essential baking needs will never be stocked up. Having Emma give us her cake supplies was a huge advantage and got us off to a good start. What has been you biggest success so far? Seeing how many people have been supporting us and our business and learning something while improving with every cake we do is our biggest success. We went from just our parent’s friends knowing about our business to all of Grand Falls. We would say that doing what you love is the most important things. If you don’t like what you are doing, you won’t enjoy it. Having someone to look up to is great. Always know that school comes first. You have to manage your time wisely. If you have a dream it’s important to get good grades so you can go to the university you want to after high school. It’s hard for us to turn down orders due to exams, but they respect that we know school comes first. It shows a sense of maturity. We are hoping our birthday parties will be a hit, and are looking forward to attending farmers markets and events. By the end of this year we hope to accomplish over 100 orders. We are already half way there. How can people buy or book your services? People can buy our products by Facebook messaging or emailing cakesbytwopeasinapod@gmail.com. If you would like to book one of our birthday parties, people will have to email us. 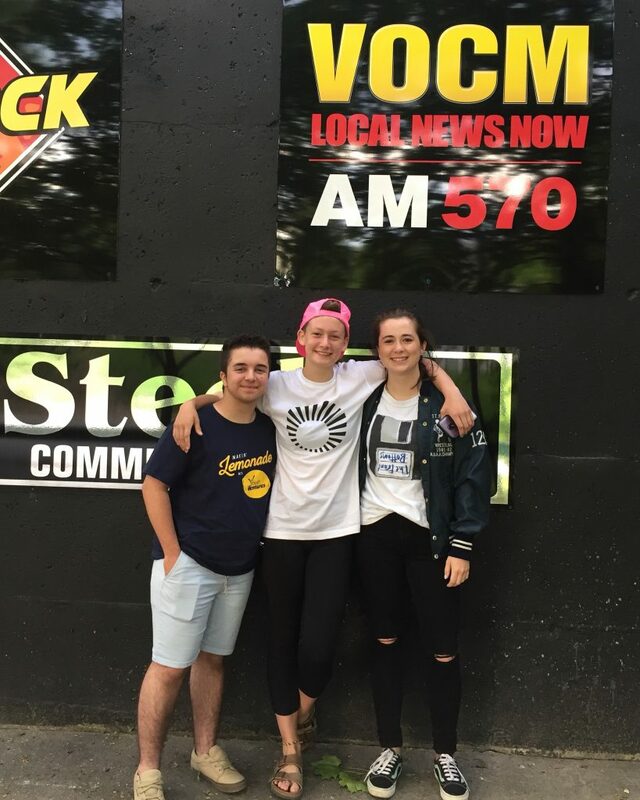 Today we are chatting with Jessie, Madison and Vinn from Camp Ohana based in Corner Brook, NL. Coming June 2018, the first LGBTQ+ summer camp in Western Newfoundland run by youth for youth, for members of the community, and alies alike! This camp will be a great opportunity to meet other youth in the community, learn how to be more involved in the community, and have fun doing it! We decided to start Camp Ohana due to the lack of resources and support in Western Newfoundland for the LGBTQ+ community. Outside of St. John’s there are no camps like the one we will be hosting! Youth Ventures believes in us and what we can do. They have helped us make connections with people we would have never met otherwise! Our dream is to see youth empowered in all aspects of their lives and their communities. We hope that Camp Ohana can help provide them with a foundation to become leaders in their own communities. We love being able to be the change we want to see! Financial aid has been our greatest challenge. We hope to charge a reasonable price so that all youth have the opportunity to attend Camp Ohana. Our biggest success has been our media coverage. We appreciate the help that local radio stations and newspapers have given us. Don’t let anything hold you back! If you have a good idea, then go for it! 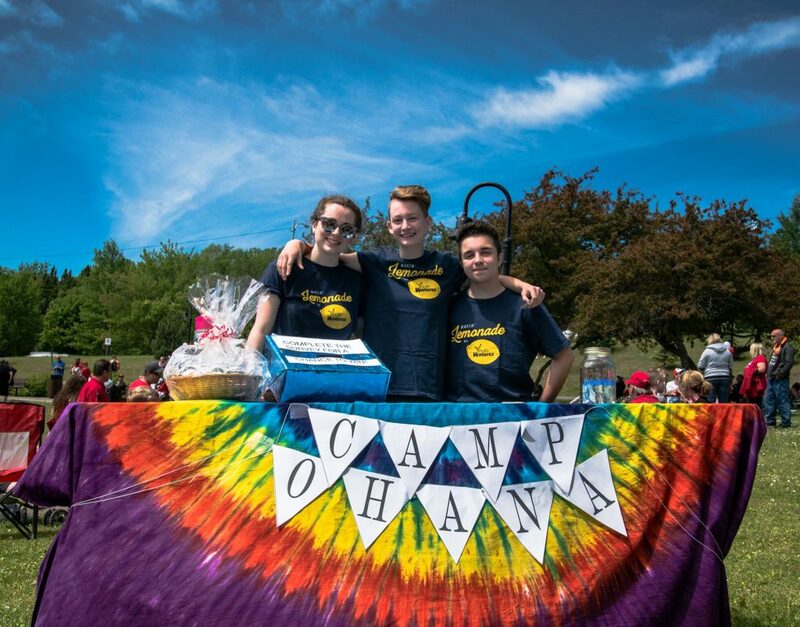 Fundraisers to help us lower our costs for youth who wish to attend Camp Ohana! Applications will be available January 1st, 2018. Follow us on Facebook and Instagram for more information! 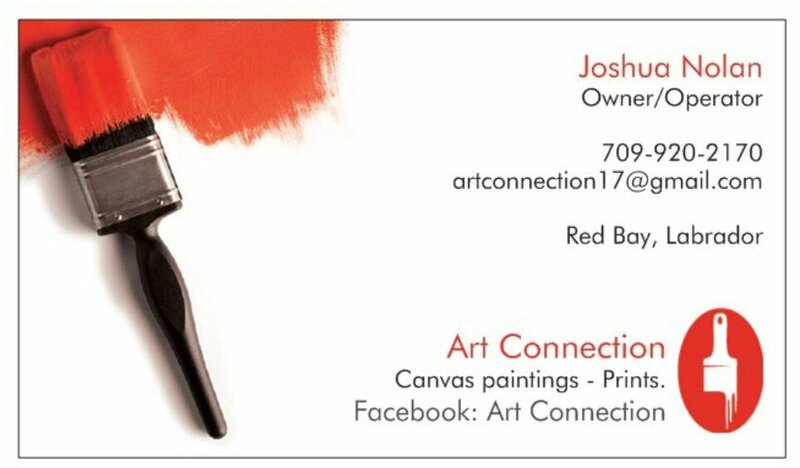 Today we are chatting with Josh Nolan from Art Connection based in Red Bay, NL. I am a self made entrepreneur that turned my talent into a local business. I hand paint mostly Newfoundland and Labradors related culture. I have also turned to designing T-Shirts and hoodies with catchy logos. Entrepreneurship runs through my veins. My Father, once being a business man had a successful company. I always had a take leadership attitude in most situations. Youth Ventures helped me advertise my company. I was featured in the Northern Pen newspaper which surfed all over social media. My dream is in the making. I am working towards having my own building where my business will be located. I get a thrill when I work hard and see great progress. Stock. When you run out of stock and have orders, you are anxiously waiting for stock to arrive to get your customer’s orders completed. My biggest success so far I would only have to say is opening my own business. You cannot expect to become a millionaire over night. You have to spend money to make money and that will pay off. Believe in what you want. Work hard towards your goals. I am found on Facebook “Art Connection“. If you are interested in starting your own business this summer, Youth Ventures can help! Head to our website to get started today. 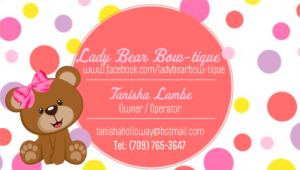 Today we are chatting with Tanisha from Lady Bear Bow-tique based in Marystown, NL. I offer baby hair accessories such as headbands, bows and clips. 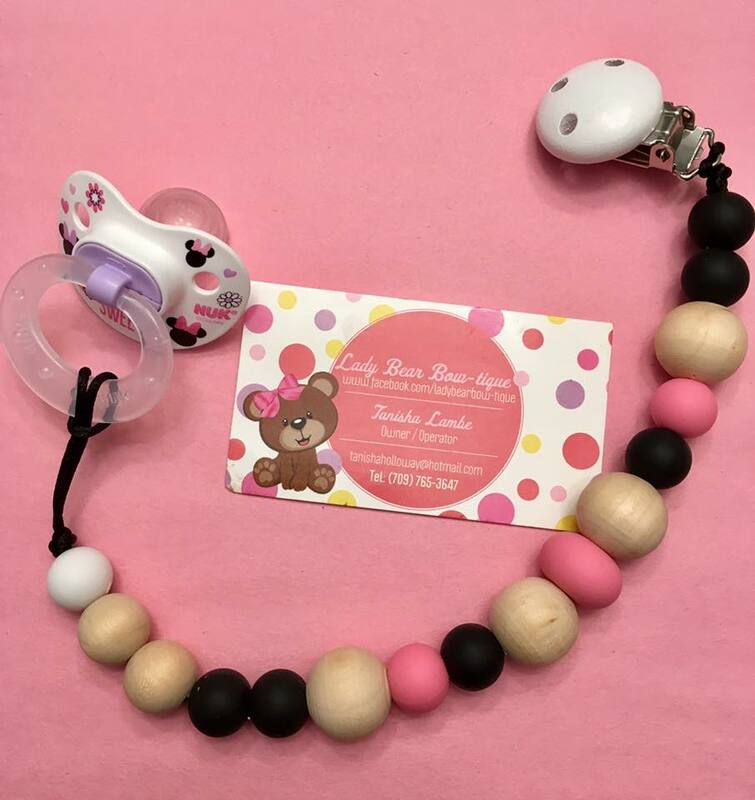 Also teething toys and nursing necklaces made from 100% all natural products. I started my business because I had a little girl and an obsession with baby headbands. There was no business on the peninsula that I knew of offering these products at the time. Youth Ventures offered a lot of help with start up necessities like promotional products such as business cards and also advertising! My dream for my business is to be a house hold name for anyone in the area with little girls! My favorite thing is to see babies wearing my creations! I enjoy working on my own time, at home, so I can still be available for all my kid’s activities. Getting your name out there when there are so many big box stores and online places to find similar products. I’m now offering my products out of a new crafter’s consignment store in Marystown. The only person who can make your business succeed is you. It takes time. And social media is the best way to advertise and it’s free! You can find me on Lady Bear Bow-tiques Facebook page or contact me via email tanishaholloway@hotmail.com or call 764-3647 for custom orders! 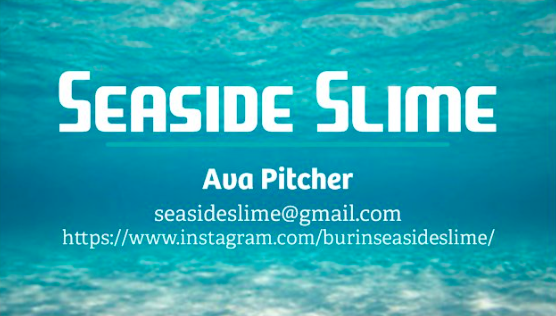 Today we are chatting with Ava from Burin Seaside Slime based in Marystown, NL. My business is about textures, trying new things, being creative, and having fun! I experiment daily with new recipes (mixtures of glue, coloring, conditioner, creams, sparkles, texture beads etc.) to develop new products. My product was initially developed for children on the Autism Spectrum as a sensory tool, a way to help these children explore new textures through touch. 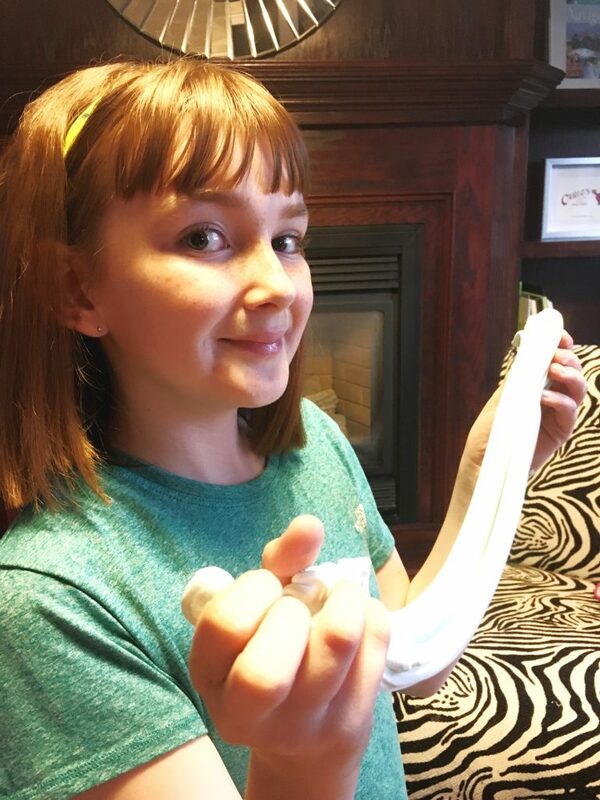 Quickly I realized that all kids LOVED slime and that there were many other uses for slime, such as an exercise tool for individuals who have lost hand/ finger strength, as well as a great cleaning tool for small spaces for example keyboards or car controls. My business started as a hobby because I love trying new things, and I especially love different textures; sticky, squishy, and fluffy. As I created Slime I began getting a lot of interest from my family and friends who thought that what I was developing was unique, I thought this was a great opportunity to share my hobby with others. Youth Ventures helped me with my branding. Lesleeanne created new logos; for posters, businesses cards, labels for my products and for my Instagram Page. Youth Ventures is helping promote my business to others. My Dream is to continue to grow my business. I want to show youth that “if you dream it, anything is possible”. What I enjoy most about my business is making the products and seeing the client’s faces when they try Slime for the first time. My greatest challenge has been in perfecting the products. I’m pretty picky and I always want to ensure clients are getting the best product possible. I continually try new ingredients, measurements and quantity, mixtures to test better consistency of product. My biggest success so far has been the young girl who contacted me, when I was only 3 weeks in to my business venture, through my Instagram page. She said I inspired her to start her own business. I felt really good about helping another youth realize their dream. My advice for future entrepreneurs is that you are never to young to realize your dream, create a great idea and start a business. Hey, look at ME! Next up for my business is to keep growing, marketing my product, and building new clients. Hoping some day soon to be able to sell online.